Any conflict situation constellates the problem of opposites. Broadly speaking, “the opposites” refers to ego-consciousness and the unconscious. This is true whether the conflict is recognised as an internal one or not, since conflicts with other people are almost always externalisations of an unconscious conflict within oneself. Because they are not made conscious, they are acted out on others through projection. Whatever the conscious attitude may be, the opposite is in the unconscious. There is no way to haul this out by force. If we try, it will refuse to come. That is why the process of analysis is seldom productive unless there is an active conflict. Indeed, as long as outer life proceeds relatively smoothly, there is no need to deal with the unconscious. But when we are troubled, it is wise to take it into consideration. The classic conflict situation is one in which there is the possibility of, or temptation to, more than one course of action. Theoretically the options may be many, but in practice a conflict is usually between two, each carrying its own chain of consequences. In such cases the psychological reality is that two separate personalities are involved. It is helpful to think of these as different aspects of oneself; in other words, as personifications of complexes. Perhaps the most painful conflicts are those involving duty or a choice between security and freedom. Such conflicts generate a great deal of inner tension. As long as they are not conscious, the tension manifests as physical symptoms, particularly in the stomach, the back and the neck. Conscious conflict, on the other hand, is experienced as moral or ethical tension. Conflict is a hallmark of neurosis, but conflict is not invariably neurotic. Life naturally involves the collision between conflicting obligations and incompatible desires. Some degree of conflict is even desirable, since without it the flow of life is sluggish. Conflict only becomes neurotic when it settles in and interferes, physically or mentally, with the way one functions. Two preliminary possibilities exist for resolving a conflict. You can tally up the pros and cons on each side and reach a logically satisfying decision, or you can opt for what you “really want,” then proceed to do what is necessary to make it possible. Many minor conflicts can be decided by reason. But serious conflicts do not so easily disappear; in fact they often arise precisely because of a one-sided rational attitude, and thus are more likely to be prolonged than solved by reason alone. Where this is so, it is appropriate to ask, “But what do I want?” or alternatively, “What do I want?” These are useful questions, for the first, with the accent on “I,” clarifies the individual ego position (as opposed to what others might want), and the second, stressing “want,” activates the feeling function (judgment, evaluation). A serious conflict invariably involves a disparity between thinking and feeling. If feeling is not a conscious factor in the conflict, it needs to be introduced; the same may be said for thinking. If the ego position coincides with, or can accept, the feeling attitude, all well and good. But if these are not compatible and the ego refuses to give way, then the situation remains at an impasse. That is the clinical picture of neurotic conflict, the resolution of which requires a dialogue with one’s other sides. We can learn a good deal about ourselves through relationships with others, but the unconscious is a more objective mirror of who we really are. 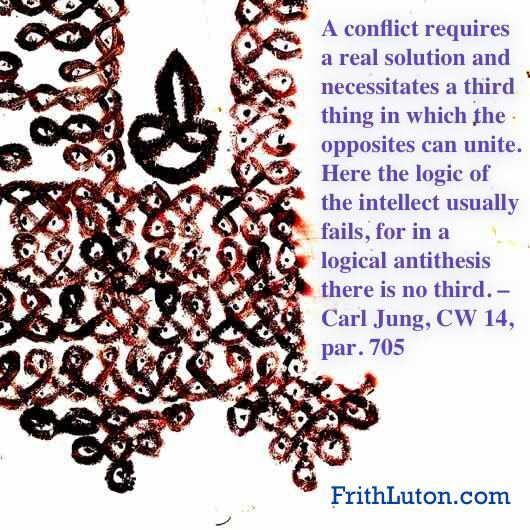 Jung believed that the potential resolution of a conflict is activated by holding the tension between the opposites. When every motive has an equally strong counter-motive—that is, when the conflict between the ego and the unconscious is at its peak—there is a damming up of vital energy. But life cannot tolerate a standstill. If the ego can hold the tension, something quite unexpected emerges, an irrational “third” that effectively resolves the situation. Outer circumstances may remain the same, but a change takes place in the individual. This generally appears as a new attitude toward oneself and others; energy previously locked up in a state of indecision is released and once again it becomes possible to move forward. At that point, it is as if you were to stand on a mountain top watching a raging storm below—the storm may go on, but you are outside of it, to some extent objective, no longer emotionally stressed. There is a sense of peace. This is not essentially different from the traditional Christian concept of grace—“the peace that passeth understanding”—except that it doesn’t come from a distant God; it wells up inside. This process requires patience and an ego strong enough to bend but not break, otherwise a decision will be made out of desperation, just to escape the tension. But when a decision is made prematurely—when the tension has not been held long enough—then the other side, the option that was not chosen, will be constellated even more strongly and we’re right back in the fire. Ah, one asks, but aren’t some conflicts intrinsically insoluble? Women are ill-advised to be smug about this passage. Jung, as a product of his time, was not gender-conscious. If he were writing the above today, I dare say he would have reworded it to include women, putting Eve on the hot-seat along with Adam.